What do you do with a sequel to a game that has a huge roster of weapons, quirky characters, and awesome 4-player co-op? You add more weapons, of course. And more quirky characters. And you might as well keep the 4-player co-op. That's the tactic that Gearbox Software seems to be using in the follow-up to Borderlands, their successful loot-driven first-person shooter/role-playing hybrid that released in 2009. As a big fan of the first title, I've been ready to play the game since...well, since I finished Borderlands 1 and all the downloadable content packages, actually. Sitting down to play a co-operative round with a fellow journalist, I knew before the character selection screen loaded that I'd be playing as the Siren. The blue-haired alternative to Borderlands' first Siren, Lilith, promises to revamp my favorite class, something that made me simultaneously nervous and excited. Tinkering with my skill tree and choosing which abilities I wanted to invest in, I noticed where this new Siren took a left turn. Maya is much more of a healer than her predecessor. The new Phaselock ability is mostly responsible for this. It's also mostly responsible for how utterly amazing the new Siren is. The Phaselock's benefits are two-fold: 1. It suspends an enemy mid-air, unable to move and, 2. You can upgrade your skill tree to receive damage and health bonuses while an enemy is Phaselocked. That makes for one very efficient killer. It also makes a leader. The team's focus goes (or should go, if you're a smart player) to the Phaselocked enemy. This is a Borderlands sequel built on the strengths of the first game. But Maya, like the other characters in Borderlands (and the game itself), is still nothing without her weapons. Although Gearbox boasts millions of guns (yes, millions)—impressive even by Borderlands' standards—only a handful were available at this preview demonstration. I played with elementals, rocket launchers, and standard assault rifles. Elemental damage-inflicting rifles are my favorite so I sported the corrosive damage weapon in Maya's inventory almost exclusively throughout my playthrough, stopping only to sample the others. The other weapons stashed into our inventories were mainly sniper-ranged, which suits my play style fairly well. Several of these scoped guns came with a lock-on targeting system. A few were even lock-on rocket launchers outfitted with scopes. Borderlands 2 bolsters the franchise's reputation for a massive amount of diverse weapons. Gearbox is scrapping their traditional method of shaping the narrative universe of their games in Acts. They're now going to model it after television's Seasons. But why Seasons? Seasons are made up of episodes, which, according to Gearbox senior producer Sean Reardon, are "bigger and more important than a mission." Episodes are considered to be larger chunks of a storyline rather than a simple task carried out by the player. Reardon describes this new development for the sequel as "evolved storytelling." 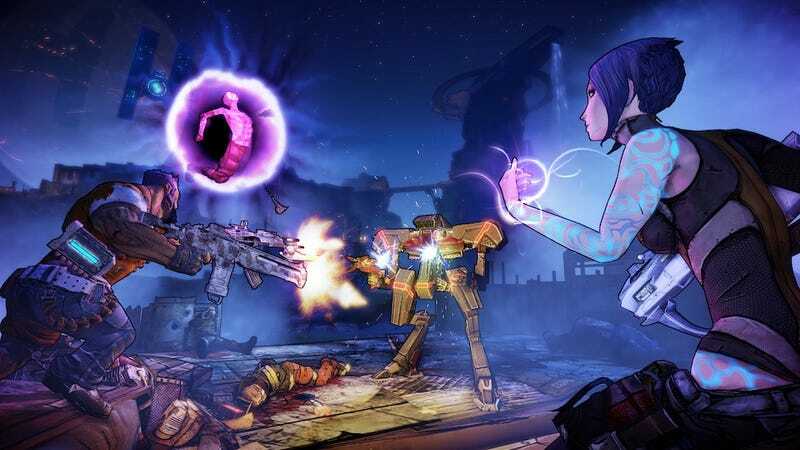 Gearbox wants Borderlands 2 to be impactful, and boring fetch quests won't cut it. "You're going to find stories happening and you're using the stories to affect the world. Missions aren't for the sake of creating more missions, but for the sake of being able to tell a more compelling story and make you feel more connected to the narrative of the world," says Reardon. He promises that this "first-rate narrative" will "pull you through the whole game." Corrosive weapon proved to be a favorite until I met the corrosive-resistant bugs. These earth-toned bugs are nothing new for Borderlands. But fortunately the two areas we were free to explore—Caustic Caverns and the Wildlife Exploitation Preserve—were host to more than just the bugs and bandits Borderlands veterans will be familiar with. Robust and versatile robots are perhaps the biggest new entry in the list of enemies. Think of every kind of CAT machinery that you've seen working on constructions sites around your city, and it's probably been made into a robot enemy in this sequel. Gearbox Software producer Randy Varnell tells me that the inspiration, after all, came from real-life machinery. Anything that real-life machines could do served as a brainstorming step for the team. So while surveyors fly speedily overhead to heal their robotic comrades, big Transformer-looking Power Loaders stomp toward you with spinning blades that reflect bullets, and Bull Loaders will actually transform into a bulldozer to slam into you with their reinforced body. Sequels offer a chance to learn from past mistakes, and to implement new features that may not have been thought of before. So Borderlands 2 is naturally a more polished game. There is a ton more visual feedback, from your shields getting shredded to literal pieces to threshers snatching you with purplish vines. Running feels faster, special ability cooldowns are quicker. In general, the game feels even more accessible than before. Borderlands 2 takes the opportunity of a sequel to also revamp the mission style. It's a chance to get rid of the Borderlands 1 missions that were all too often composed of boring fetch quests. Rather than simply carrying out a fetch quest, you will occasionally be offered a choice in Borderlands 2. During one questline in Caustic Caverns [minor spoilers] I was presented with the choice to either return the contents of a safe I had just recovered for Marcus, or to bring the nudie pictures that were inside to Moxxi [take a breath]. Your choices are more for momentary fun than any real impact on the main story. It's a refreshing change of pace to the otherwise standard routines of following arrows on your map. This is a Borderlands sequel built on the strengths of the first game. Strange creatures, lots of variety in weaponry, large clusters of enemies, quirky humor and fantastic art are still staples of the game. The colors are a bit more varied, and the textures look smoother. It's an amplified Borderlands 2, and hopefully the release of the game on September 18 will prove that.